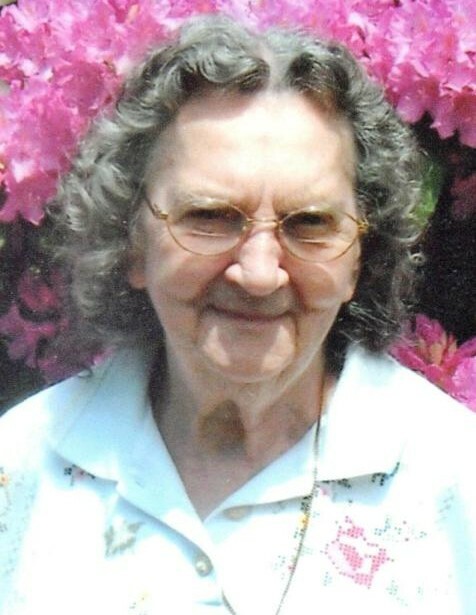 Obituary for Leah M. Dempsey | Hile-Best Funeral Home, Inc.
Leah M. Dempsey, 97, of Oil City, died Wednesday morning, May 30, 2018, surrounded by her loving family. She was born on February 20, 1921 in Niles, Ohio to the late Otto Ferdinand and Alice Veronica (Beers) Rothfuss. She was a graduate of Oil City High School. Mrs. Dempsey was a longtime member of St. Joseph Roman Catholic Church in Oil City. Leah was an active member of the Rouseville Fire Department Ladies Auxiliary where she enjoyed helping with Bingo and their rummage sales. She enjoyed crocheting, quilting, and flowers. She was a dedicated homemaker, caring for her family. Leah was married in Oil City on September 21, 1946 to Leroy Albert Dempsey, and he preceded her in death on May 22, 1991. Surviving are five children: Darlyne Delp and her husband Jerry of North Carolina, Sandra K. Smith of Oil City, LaVonta Webb of Grove City, Richard Dempsey of Oil City, and John Dempsey of Cooperstown; eighteen grandchildren: Jamie, Robert, Jerry Jr., Bobbie, Scott, Terry, Joel, Patricia, Alesha, Audrey, Amanda, David, Tiffany, Jimmy, Ricky, Chris, Heather, and Amber; and numerous great-grandchildren. In addition to her parents and husband, she was preceded in death by her infant twin daughters, Alice Marie and Mary Agnes; a brother, William Rothfuss; two sisters, Ruth Armstrong and Jean Grant; and a son-in-law, David Webb. Friends will be received Sunday (June 3) from 1 - 3 and 6 - 8 p.m. in the Hile-Best Funeral Home, 2781 Rte. 257 in Seneca, Cranberry Township. A funeral service will be held in the funeral home Monday (June 4th) at 10 a.m. with Father John Miller, pastor of St. Joseph Church, officiating. Interment will follow in Dempseytown Lutheran Cemetery, Oakland Township, Venango County. Memorial contributions may be made to the American Cancer Society, P.O. Box 22478, Oklahoma City, OK 73123; or to the Venango V.N.A. Foundation (Hospice), 491 Allegheny Blvd., Franklin, PA 16323.